If you're over 18 then the act of going to a bar might have lost a bit of its edge. But you can get it back trying to get past the bouncers and guest list at Purl. This speakeasy-comes-to-London-and-joins-forces-with-a-gin-palace, renews a bit of the naughty fun in drinking by being a bit exclusive, a bit personal, and serving mightily finely crafted cocktails that make it feel like you're rediscovering alcohol. The exclusive hurdle you can overcome, along with the bouncers, by booking in advance. It's free, and means that you know you're going to get a table and drinks service – so that's something different from your local boozer already. The personal bit comes with the service not the intimacy of the venue. When you're heading downstairs, past the bouncers, to the entrance it feels like you're going to enter somewhere dingy and cramped, but it's actually pretty spacious (in fact it might be that they could accept a couple more bookings a night before it gets squashy.). 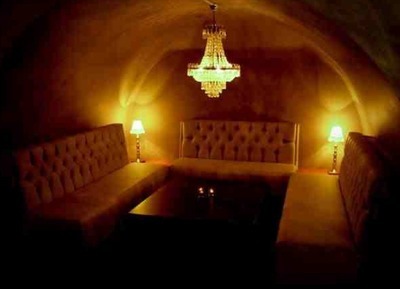 This was once the basement of one of those lovely Georgian terraces, so the roof is low, but the nooks, crannies and tables are positioned a comfortable distance from each other – after all you can't have people overhearing you at a speakeasy... The décor is eclectic, woody and interesting – London Prohibition Chic if you can imagine it. And now to the drinks – for despite the endearing atmosphere, this is still a bar and it's still all about the drinks... Cocktails are the bev-du-jour, and they're best described generally as classics with a twist. The take on the traditional 'fizz', involves chocolate bitters and home made Orgeat syrup, their 'green fairy mix' involves Hennessey VSOP and Peychaud Bitters and their 'martiniz' involve Maraschino Liquer. So even if you're a serious cocktail connoisseur you'll still find something new and/ or exotic to try. And they don't just make the drinks at Purl, they mix them to scientific perfection, infusing this in that and letting it brew or knock about together for just the right length of time – before chipping a bit of ice off the huge block they have sitting behind the bar and serving it to you in just the right glass at just the right temperature. But if you're a real aficionado they'll tailor your drink to your own specifications. And if you don't like anything too frou frou, they do bottled beers and wine as well. This is the kind of place where you'd want everyone to know your name if you're a pedant with a penchant for cocktails, sort of the way you imagine private members clubs to be before you've ever been to one. When: From 5. Booking is very much advised.